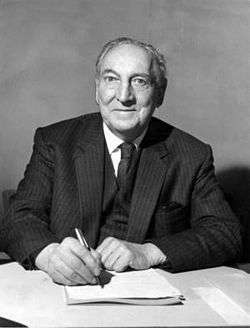 James Griffiths CH PC (19 September 1890 – 7 August 1975) was a Welsh Labour politician, trade union leader and the first ever Secretary of State for Wales. He continued his education by attending night school and became an active socialist. He helped establish a branch of the Independent Labour Party in Ammanford in 1908 and soon became its secretary. He went on to occupy the powerful post of secretary of the newly formed Ammanford Trades Council between 1916–1919. At age 29, he left the colliery on a miner's scholarship to the Central Labour College, London, On returning home he worked as Llanelly Labour Party agent, between 1922–1925, before becoming an agent for the Anthracite Miners' Association, 1925–1936, and President of the powerful Miners' Federation of South Wales – The Fed – in the Anthracite district of West Wales between 1934–1936. In 1936, he was elected Labour Member of Parliament (MP)] for the safe seat of Llanelli. Three years later he continued his rise through the Labour movement by getting elected to Labour's National Executive Committee in 1939.